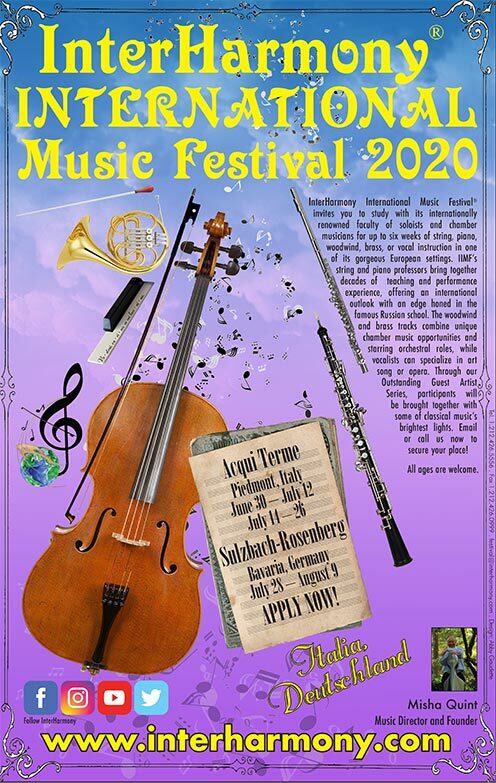 Tuition (in USD) includes 2 lessons per week, 2 chamber coachings per week, lectures, seminars, master classes, orchestra or opera (if applicable), room/board in a double or triple room capacity with 3 meals per day and excursions provided by the festival.Click to see excursion details! Complimentary shuttle to/from Nuremberg Airport to Sulzbach-Rosenberg. Application and deposit fees are included in the tuition, except $60 late application fee after February 1, 2019. Rooms are subject to availability and may include shared bathroom. Certain restrictions may apply. Tuition (in USD) includes 2 lessons per week, 2 chamber coachings per week, lectures, seminars, master classes, orchestra or opera (if applicable), room/board in a single room capacity with 3 meals per day, and excursions provided by the festival. Click to see excursion details! Includes concert admission, admittance as an observer to master classes, lectures, and seminars, room/board in a double or triple capacity with 3 meals per day, and excursions provided by the festival.Click to see excursion details! The Guest Rate is for is for auditors and for guests of students who have been accepted into InterHarmony International Music Festival. Guest deposit is included in the overall guest rate. See "Guest Form" page for more details. Includes concert admission, admittance as an observer to master classes, lectures, and seminars, room/board in a single room capacity with 3 meals per day, and excursions provided by the festival.Click to see excursion details! 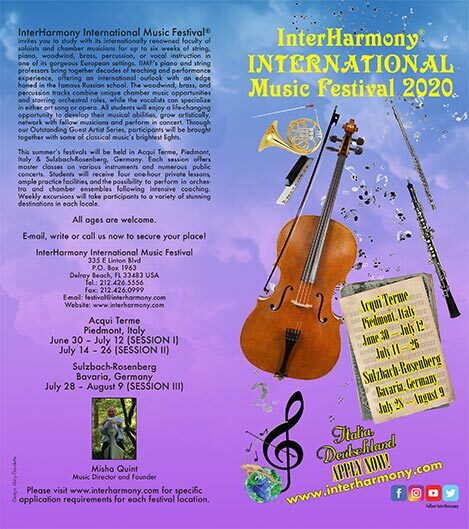 The Guest Rate is for is for is for auditors and for guests of students who have been accepted into InterHarmony International Music Festival. Payment in full by March 1, 2019 is eligible for a 10% discount. Students who wish to attend more than one session are eligible for 10% off each additional session. Discounts only apply to students. The application fee and late application fee (after February 1, 2019) are non-refundable. If you have any questions, feel free to contact us at: [email protected] or by using our Contact Form. Questions about the Shuttle? Detailed information can be found on the Shuttle Page. Click to download our beautiful posters and brochures.